This has been a real favourite of mine over the last few months. Aside from being perfect colours for the start of the summer, the flavours are light and go great with a glass of Prosecco! The addition of a tiny amount of professional quality green food colouring paste makes these stand out perfectly at any Alzheimer’s Society Cupcake Day so remember this recipe if you are entering a bake off! Add the vanilla extract, 75g of the chopped pistachios, and a little milk (if required) to make a dropping consistency. You can also add a scant amount of green food colouring paste if you would like to make the cupcakes a shade of pistachio green – they will not be green with the nuts alone. To make your raspberry cream, beat the butter until soft (best done in a free-standing mixer) and add the icing sugar. Loosen this with a tablespoon of cream cheese and raspberry jam. Whip the mixture until light. Pipe or dollop a little raspberry cream on the top of your cupcake, immediately sticking the two cut pieces (or ‘butterfly wings’) into the cream. 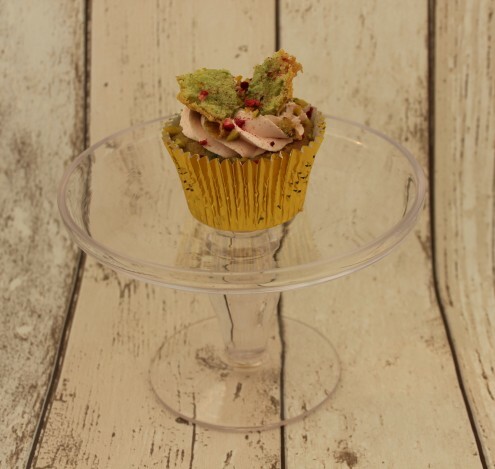 I have sprinkled the top of my cakes with freeze-dried raspberries and the remaining 25g chopped pistachio nuts.